Dark Energy: Was Einstein Right After All? You've probably never heard of a galaxy known as NGC 6264, and you've surely never given it a whole lot of thought. But the distant star cluster has just provided astronomers with new insight into one of the most mysterious forces in the universe. To understand that force even a little, think about the last time you threw a baseball straight up in the air. What happened was what will always happen as long as you live on earth: gravity made the ball slow, stop and fall back to the ground. If you were born on the planet Krypton and landed here as a baby, the ball would reach escape velocity and shoot into outer space. Astronomers trying to understand the history of the universe have long thought of galaxies as huge, shiny baseballs. They were flung outward about 13 billion years ago, in the Big Bang; that's why the universe is expanding. But whether they would someday stop and reverse direction under their mutual gravity or keep going forever wasn't clear. To figure it out, two teams of observers decided more than a decade ago to look deep into the cosmic past, by comparing the velocity of extremely distant galaxies with that of closer ones. The farther you peer into space, the farther you peer back in time, and so if the more remote galaxies are flying apart faster than the close ones, that means the slowdown has already begun. If not, it will probably never happen. To the astronomers' amazement, they found that the universe is actually expanding faster now than it was billions of years ago. It's as though the baseball had a rocket attached. And the only plausible explanation was that some mysterious, invisible source of energy must be pushing the universe apart faster and faster all the time. That mysterious force came to be known as dark energy, and to date nobody has figured out exactly what it is. 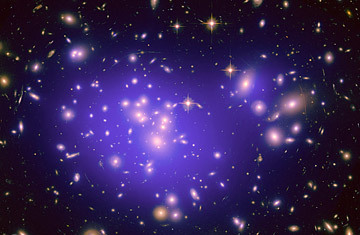 All astronomers know is that dark energy seems to make up more than 70% of the matter-energy content of the universe. The rest is mostly the equally mysterious dark matter. Ordinary matter  the stuff that stars, planets and people are made of  amounts to a couple of percent at best. Theorists have advanced a bunch of competing ideas about the nature of dark energy  including Albert Einstein, who proposed a form of dark energy called the "cosmological constant" nearly 100 years ago. Even Einstein kept things pretty vague, venturing only that his constant would keep the force of repulsion the same everywhere in the universe  and that's as good a guess as we've had ever since. "Shake a tree full of theorists and 20 ideas will fall out," is how Adam Riess of the Space Telescope Science Institute in Baltimore, Md., a co-discoverer of dark energy, described it to TIME in 2001. To figure out who's right will take a far more precise measurement than anyone has done to date. That's why a new observation by scientists at the National Radio Astronomy Observatory, in Virginia, could be so important. By linking a group of far-flung radio telescopes into a virtual telescope thousands of miles across, James Braatz and Cheng-Yu Kuo have measured the distance to galaxy NGC 6264 to an accuracy of 450 million light-years from Earth, give or take 9%. That's crucial, because while it's simple to measure how fast a galaxy is moving, you also need to know exactly where it is. Imagine that a car is accelerating toward you, and you want to know when it will zip by. To calculate that, you need to know not only how fast it's going at any given moment, but also how far away it is. Astronomers already have ways of measuring distance, but they're based on a system of steps. The first is a direct measurement of the distance to a nearby cosmic object using the same parallax method sailors use. Next, that measurement is used to gauge the distance to farther objects, which are used in turn to measure still farther ones, and so on. Each of these steps introduces errors, so it would be better to measure distant galaxies directly. That's what Braatz and Kuo have done. They've homed in on the black hole at the core of NGC 6264  or more precisely, the disk of gas that swirls around it before being sucked into oblivion. Water molecules in the disk act as natural masers  essentially, they're lasers that transmit in radio frequencies rather than visible light. With those masers acting as beacons, the astronomers used a single radio telescope to figure out the actual size of the disk. Then they used their virtual radio to measure its apparent size  how tiny it looks at such an enormous distance. It's something like knowing the real size of a silver dollar, seeing how big it appears across a field, then asking yourself, "How far away would it have to be to seem that small?" This isn't the first time Braatz and Kuo have performed this trick, but it's the farthest galaxy they've attempted to survey. "We have another six or so in the can," says Braatz, "and we ultimately want 10 or so." It's also not the most precise measurement ever made: the old-fashioned, step-by-step technique is accurate to within 6%. Ultimately, though, Braatz hopes to get the new method down to 3% accuracy. "It's hard work," he admits. "There's no guarantee we can do it." If they can, though, it will bring theorists a step closer to understanding what dark energy really is  and maybe even vindicating Einstein. That would be ironic. Back in the 1920s, Einstein abandoned the concept of the cosmological constant, calling it "the greatest blunder of my life." If dark energy really does match his long-ago idea, his greatest blunder could also turn out to be his final triumph. See "The Hubble Space Telescope's Greatest Hits."